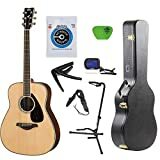 Yamaha FG840 Guitar Review 2019 – is the Yamaha FG840 acoustic guitar worth the money? Review of features, pricing, design, sound and more. Made for intermediate players and beginners alike, the Yamaha FG840 is an acoustic guitar that looks stylish and modern from the outside but has the soul of a classic beauty. This full-sized guitar can fit in within both full-band and solo performances. The Yamaha FG840 guitar is part of the esteemed FG series of guitars, and in this write-up we shall delve deep into what great features it brings to the table, and how do those attributes make it a better guitar than what Yamaha has done with its FG lineup before the FG840. Before we get on with reviewing the FG840, we must look into the history of Yamaha’s FG series of guitars, for some context. The FG line of guitars first came to light in 1966 when the Yamaha FG180 and the FG150 were introduced. This is several decades after Yamaha was founded as a music instrument manufacturing company in 1887. Back then, it only made organs and pianos. Guitar manufacturing happened only during the early 1940s. And after a few decades, the FG line of guitars were made. Unlike other brands that focus more or marketing and promotions, Yamaha has always relied on the quality of its products. Its products have always done the talking, which is the reason why it has been in the industry for so long. Yamaha also doesn’t attach a hefty price tag on its offerings, which has also contributed to the longevity of the brand. Over the years, Yamaha has worked very hard to keep up with the tradition and style the original FG guitars embodied. Also, the company has kept up with the trends, making sure all new technologies were incorporated as seamlessly as possible into their newer FGs. Since 1966, there has been more than 200 FG guitars, and all have been considered ideal acoustic instruments by many contemporary players. Each aspect of a Yamaha FG guitar is crafted to create a better guitar than the preceding model. And the same hardship and commitment has gone into making the FG840 guitar too. From painstakingly cured woods and hand-sprayed finishes to extensive quality control checks, every FG guitar is manufactured to last a lifetime. The Yamaha FG840 gives you the traditional vibe from the outside. It looks classy, attractive, and also has a premium feel. The guitar is built well too, thanks to the strong materials used and the great finish that adds to the durability of the guitar. In other words, the guitar can withstand minor bumps and dings without getting blemished or scratched. Despite adapting well to new trends and technology, the guitar still keeps the spirit of yesteryear FG guitars. The dreadnought body shape and size, urea saddle, rosewood bridge, matte neck finish, etc. would constantly remind you that you’re handling an FG. The solid spruce stop, which most people have come to learn and love in acoustic guitars, adds to the durability and sound of the FG840. The solid tonewood ensures the guitar sounds better as it ages. In other words, the guitar emits greater and enhanced sound with frequent use. Thanks to the maple laminate on the guitar’s sides and back, you get a more balanced and transparent sound. This ensures you have concise and clear notes for finger picking or strumming. Though the sustenance lacks a bit compared to other FG series models, you get the strong and loud sound that can easily hit the lows and mids. Moreover, the Yamaha FG840 has a fresh scalloped bracing pattern that maintains the durability of the top board while making sure the guitar offers the best possible sound. Not to mention, the advanced technology used in the guitar makes it a real upgrade over its predecessors. Yamaha’s R&D division has worked hard to come up with the cutting-edge acoustic analysis tech that has been injected into the FG840. This was achieved by employing simulation techniques and rigorous analyses. This analysis resulted in the creation of the unique scalloped bracing pattern, which is a new and perfect acoustic structure for maintaining the top board’s durability and extracting optimal sound from the guitar. Another great thing about the FG840 is its packaging. The guitar comes with everything that you need so that you can start playing it right out of the box. The package comprises a hard case, strap, clip-on tuner, and additional strings. In addition to all of this, you also get an instructional DVD. This DVD would come in handy if you’ve never played a guitar before. As aforementioned, you may play the guitar right away. The guitar holds tune pretty well for days before requiring a maintenance session. The quality control checks and hand-sprayed finishes ensure you’ve got a guitar for life, provided you treat it well and take necessary care. And if anything breaks or goes wrong, there is the excellent Yamaha customer service that you can always count on. The FG840 guitar is built well, sounds great, looks good, and is comfortable to use. Though the guitar primarily caters to amateur and intermediate guitarists, professional guitar players would not find this guitar outright shabby. In fact, if they approach the guitar with little expectations, they would truly be overwhelmed with what they get. The classic and beautiful design that has impressed one and all, and the much superior sound quality compared to its predecessors make this guitar a well-rounded offering. There are a few minor drawbacks as mentioned before. If those don’t bother you much (which they shouldn’t), you will be more than satisfied with this guitar. Based upon feedback submitted by over 40 customers the Yamaha FG840 Guitar has received an average 4.8 out of 5 star rating. We discuss why in this review article.